Now when the Goose season 2018 is getting near to the end we start to think about the 2019 season. We have some spots available still and if you are interested please send us request. 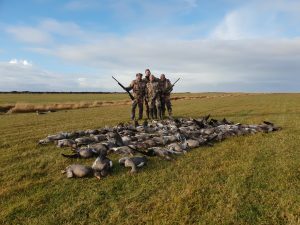 Goose hunt in Iceland is a great adventure. 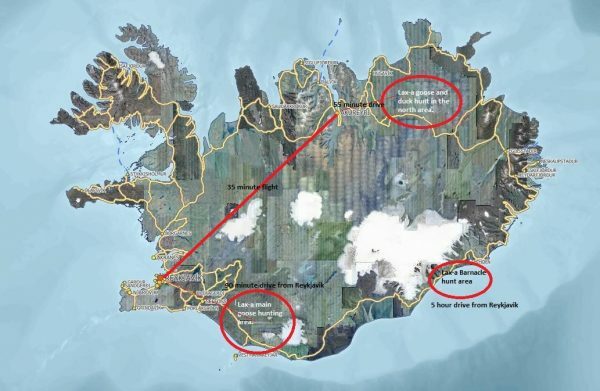 From 2012 on wards Lax-a has managed 500 hectares of corn fields on the south coast of Iceland, right in the middle of the major territory of the Gray Lag and the Pink Foot Goose. Barnacle Geese that come from Greenland can be in big numbers as well but are not as reliable as the Gray Lag and Pink Foot goose. Early October is best for Barnacle Goose. This operation will guarantee you the highest expectation of Goose hunt. Well managed by highly professional guides that put all year around effort in to it so you will succeed when you come and shoot with us. First class lodge, great food, professional guides, best possible shooting areas will secure that you will have a great trip with us. Our aim is to hear you say … see you next year .. Same dates please! The season runs from 20th of August (Barnacle goose season begins on 25th of September) until 15th of November. The guides will supply all the necessary blinds, decoys and calls that are required. The shooting mostly takes place in the early mornings until noon. That leaves a big slice of the day free to look at other fun pastimes in the area. Full board and lodging is included in the package, both accommodation and food is excellent in the East Ranga lodge. · Full board and lodging , private room to each gun. · Guiding , 4WD vehicle , One pr. every three ( 3 ) hunters. · Our best shooting areas. · Certificates needed to take your birds out of the country.